In Harmony, palettes are individual *.plt files that can be copied, transferred and stored. When a palette is created in Harmony,it is stored in your scene's palette-library subfolder by default, and linked to your scene's palette list. However, Harmony has advanced palette management features that allow you to store and manage your palettes in manners that may better serve your production's needs. This is called Advanced Palette Lists mode. To enable these features, you must enable the Advanced Palette Lists preference—see Enabling the Advanced Palette Lists Mode . 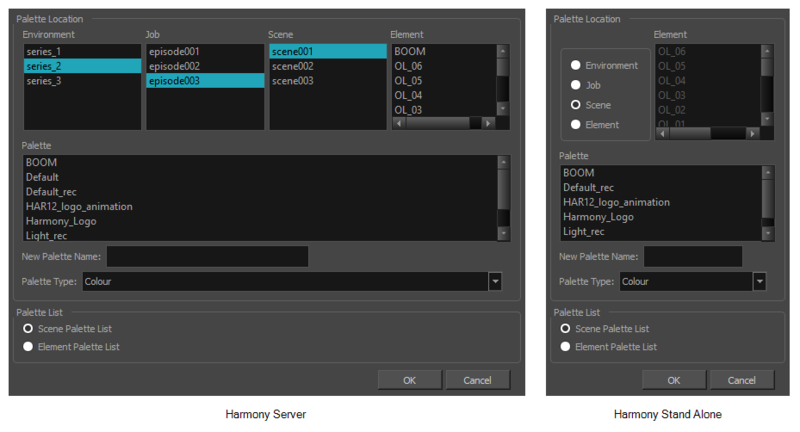 Palette location: While palette files are stored in a scene's palette library directory by default, you can choose to store palettes in different locations, allowing you to easily share palettes between different scenes in a Harmony Server database. Palette list type: Whereas palettes are usually added to a scene's palette list, making them available to all the elements in your scene, you can also choose to add palettes to the palette list of individual elements (layers) in your scene. When the Advanced Palette Lists mode is enabled, Harmony open a dialog called the Palette Browser whenever you want to create, import, clone, duplicate or link to a palette, which allows you to decide your palette's location and palette list type. To use advanced palette lists, it is important to understand the difference between a palette's location and a palette list's level. For example, it is possible to add a palette file stored in a scene's palette library folder to an element's palette list. This can be useful if you wish to have the same palette file used by several specific elements in your scene, without copying it in the palette library folder of each element that uses it. The reverse is possible: You can add a palette file stored in an element's palette library folder to a scene's palette list, making the palette usable for all the elements in the scene, even if it is stored inside a single element's folder.